This page contains answers to the mostly commonly asked questions we get from ticket holders. If you still have questions after reading this page, please contact the organization from which you received your ticket. What if one of my football teams does not play (has a bye)? Football teams that do not play (have a bye) in a given week are assigned their score from the previous week. For example, if a team has a bye in week 8, then the score from week 7 is used. We need to do this because the sweepstakes game cards are printed before the pro football schedule is released. Read official rules for more details. What do I do if I lose my game card? CharityMania only knows what ticket numbers have been distributed. We do not know the names of the people who acquire the CharityMania Tickets and therefore have no way of determining what ticket you’ve acquired. As a result, we are unable to retrieve a ticket that has been lost. To retrieve your ticket, you must contact the organization that provided you with the ticket. How do I collect the prize money that I won? CharityMania does not handle any money from CharityMania Ticket sales or sweepstakes prize money. All money is handled strictly by the participating organizations. To inquire about prize money that you believe you have won, talk to the organization that provided you with your game card or send a message to them using our on-line request form. What happens if my game card's score is tied with another game card? A game card’s score (or value) is equal to the total number of points scored by the teams on the game card that week/race. If two or more game cards have the same score, then the number of total yards gained, hits, shots on goal, or pole position by the teams on the game card is used as a tiebreaker to determine the winner. The more total yards gained, hits, shots on goal, or pole position by the teams on the game card, the higher the game card’s value. Please note that higher tiebreaker values are better for the “High Score Winners” and lower tiebreaker values are better for the “Low Score Winners”. Read more details and examples of how ties are broken in each fundraiser. How can I request a CharityMania sweepstakes game card? Option #1: Purchase an item from one of the participating non-profit organizations and receive an “instant-entry” sweepstakes game card. 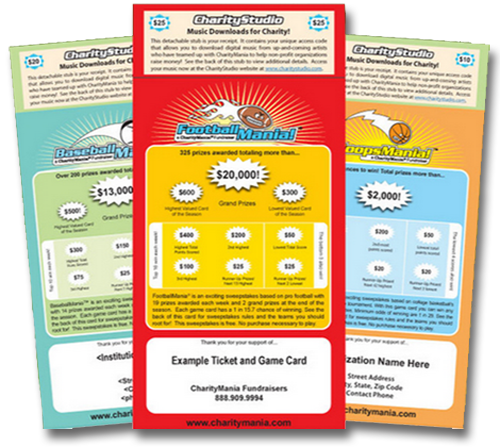 We strongly encourage all sweepstakes game card recipients to purchase items from one of the hundreds of worthy causes that are using CharityMania fundraisers to raise money. The non-profit organizations use the fundraisers as a way to generate interest and income for their good causes. Most participating non-profit organizations sell CharityMania tickets, which provide the buyer with a fantastic collection of digital music downloads. Option #2: Request a sweepstakes game card without purchasing an item. You can request a free game card, in person, from any one of the participating organizations. No requests can be made via the phone, e-mail, or the internet. All requests must be made in person to the participating non-profit organization’s lead organizer. Read more about the rules and restrictions for people who want to request a free ticket. Where can I find the official rules for the sweepstakes? I still have questions? Whom should I contact? If you still have a question, please contact the organization from which you received your ticket or sweepstakes game card. Or send us an email and we’ll get back to you as quickly as we can.